Borderless account is their newest service introduced this month, which allows you to open a bank account quickly online in order to have money deposited on it. This makes it great to be used by expats, freelancers, business owners and whoever has the need for international transactions. no monthly maintenance fees requested from you. It will not cause you any concerns or problems if you have bad credit history. Such enquiries are not being raised, so you can freely open an account. You can deposit money on it in euros, US dollars, British pounds (GBP) and 13 more currencies which ensures easy and cheap payments to be made in currency of your choice. Each currency gets assigned with its very own local bank account details, so that the transaction can be conducted as it would for a national bank account. If you would deposit GBP to your bank account, you would obtain a sort code and account number, which are used to receive local GBP payments made via the Faster Payments scheme. With US routing and account number, you can receive both ACH and domestic wire payments sent from within the United States. For euros, you are assigned with your own SWIFT/BIC and IBAN details. This simplifies international collaboration for non-residents and for foreigners who are freelancers or business partners with companies located in USA, GB and many other countries. If you are one of them, I definitely suggest opening a Borderless account as a solution for the usual challenges that you are faced with. This makes the Borderless account very practical in comparison with national bank accounts offers. International bank accounts are not available to everyone. Many of them require you to keep a high minimum balance, or to pay a monthly fee, ranging from £5 up to £15. They will also request from you a lot of paperwork to justify source of your income, you may need to be a resident etc. Borderless account has no monthly fee charged, there is a small commission when you are exchanging currencies so that you make a payment in a currency different to the one in which you deposit money on your account. For transfers between the UK and other countries, you can receive local GBP payments made via the Faster Payments scheme. In the near future, you’ll also be able to receive BACS payments, allowing you to have your salary and other types of regular, scheduled earnings paid into your account, without going to bank. For example, at the time being, you can receive your wage if you are located in Spain and you are being paid in euros. This would be processed as a regular bank transfer into your Borderless account. Receiving salary to your Borderless account can also be arranged if you are being paid in US Dollars via ACH or domestic wire. The new option they have introduced is making simple transfers in one currency which transforms your online account into a worldwide and European one. Since TransferWise was primarily an option for currency exchange at an international level, for simple money transfers a small value flat fee would be included. This fee is charged in order to cover the costs of the transaction, and varies by currency: 50p, 0.60€, $1.30 etc. When exchanging currencies, the commission is such that when sending 1000 pounds the person in the EU raises 1,138.50 euros. The included commission for TransferWise is 4.98 pounds and the guaranteed time to complete the transaction is 24 hours from the moment of arranging the transaction. By easily comparing this commission with the one requested by similar providers, you gain an impression that this is by far the cheapest one out there and also one of the quickest ones. They are making the effort to bring the commission they charge you the closest possible to the mid-market rate. 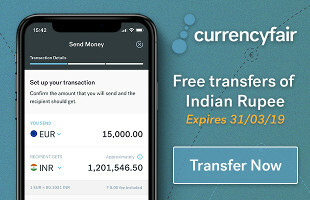 It is also worth noting that with TransferWise the recipient will not be charged for receiving the transfer, which may be the case with usual international transfers. It can be of great use for you, regardless if you are in London, UK, India Australia, Germany, Gibraltar, in the USA, Latvia Poland, Spain, Zurich, Switzerland, most parts of the world are covered. MyBank tracker has recently published an article with a detailed comparison of the wire transfer fees charged by the 10 largest U.S. banks – Bank of America, Chase, U.S. Bank etc, conducted using data from May 2017. Regarding the banks providing similar services in the UK such as UK Barclays, UK Santander, Natwest, UK Lloyds, their international bank accounts are not available to everyone. Also,majority of them require a high minimum balance to be kept or you are charged a monthly fee. The monthly fees of these standard banks are usually ranging from £5 up to £15. For example, on an international account in Lloyds bank a monthly fee of £7.50/€8/US$10 will be charged. You require a sole annual income of £50,000 or £25,000 to save or invest (or currency equivalents). There are also costs attached, which you need to bear in mind. International drafts cost around £15, and electronic funds transfers around £25. The usual dilemma people have when something new and somewhat revolutionary comes up is regarding the safety of it, so I am expecting a similar question to emerge here –Is Borderless account safe? TransferWise as a company in general is under the control of FCA – Financial conduct Authority, so the case is similar with the Borderless account. Since TransferWise is an Electronic Money Institution, it is required by law to keep your money safe by storing it in a low -risk financial institution (e.g. bank account). For those concerned about the efficiency and safety of such system, more than 38 000 TransferWise reviews available on Trustpilot can help in reassuring you and leaving you in good faith with this system. Most of the comments are saying that TransferWise is safe, quick and efficient. Less than 5% of comments are the criticizing ones. Their Support Center team has also gained highest possible scores, so you will definitely not lose out if you open a Borderless account with them and try using their services by making your first transfer, which may turn out to be more than a wise one. I live in the USA but I receive my monthly retirement money in a german bank. I use TransferWise every month to transfer money from my german bank account to my US bank account,; with other words, I have already a reference # from TransferWise. My question, can I open a borderless account with TransferWise? Yes, I think you should be able to get the borderless acount, just apply for it. Can you purchase things such as airline tickets or train tickets online with your borderless account? The debit card that is linked to your borderless account is good to pay for tickets. Of course first you will need to deposit money to the borderless account.